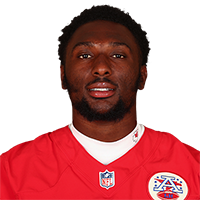 Published: Jan. 12, 2019 at 07:42 p.m.
Kansas City Chiefs quarterback Patrick Mahomes pushes running back Darrel Williams into the end zone for a key late touchdown. Published: Dec. 13, 2018 at 09:01 p.m. Published: Aug. 30, 2018 at 09:59 p.m.
Kansas City Chiefs quarterback Matt McGloin finds Kansas City Chiefs running back Darrel Williams for a 7-yard touchdown completion.